Great service and more importantly an honest service. They had to reschedule but Travis called almost two hours ahead to see if we were ok with it. Things come up and I understand that changes needs to be made on the fly. Travis came than at the the new time me on points my and did a great service. Will recommend this company to my friends. Too bad they don't to plumbing to help my drain!! Hope the next plumbing company loamy is as good as they were. We highly recommend this company. Our AC went out last night during a heat wave. Every company that we called turned us away and said they were too busy, or, they had mark-ups on all of their labor and equipment since it was a heat wave. We talked to Laura this morning, and she said their pricing is standard regardless of if there is a heat wave or not. Within ONE HOUR, Mike was at our door and went to work. DURING A HEAT WAVE!!! I had one company tell me they could send a service technician out IN A MONTH! I'm a new Customer but they earned my business for life. On top of that, Mike had a great attitude, super straight forward pricing. Our AC is about 27 years old, and instead of pushing a new unit onto us, he told us the minimum fixes we needed to get it up and running. Plus, he listed out some suggestions he had to make it more efficient along with how much it would cost. They are a small family owned business. I'm going to keep their business card IN MY WALLET. That's how much I think of these guys. I don't even carry my own business cards in my wallet. My AC went down Friday night during the long weekend and one of the hottest weeks. After reading the reviews for complete comfort heating and air I decided to give them a call. They sent out Mike within 24 hours. he was able to troubleshoot the problem, and fix my AC in less than an hour. Mike saved my long weekend. The AC is up and running. Couldn't be happier with their service. On the Friday before one of the hottest Labor Days in recent history, our A/C broke down. The very next day, on the Saturday of Labor Day weekend, we got an appointment when everyone else said the best they could do was Tuesday. Eric was congenial and knowledgeable. After a briefing on our problem, Eric got right to work. Our issue was the capacitor. Even after that replacement he fully inspected the condenser and duct work and our registers. And I appreciated that he shared his findings and kept us informed of what was going on in real time. In Southern California, A/C is so vital, we joined the membership to better and cost effectively maintain our heating and cooling system. 5 stars for the company and for Eric! Not only his price was the most reasonable, his work and service went beyond my expectations. I needed him because of our sale of our home. The buyer's home inspector ask HVAC to fix few things in our house. At that time, I forgot to ask him pictures of his work. So few weeks later I asked him if he had pictures of his work, he immediately replied back to me with all his pictures. I don't think most of HVAC keep pictures so I really appreciate for that. Like many others in OC my air con unit stopped working yesterday. It has been 85 to 90 degrees in the evening here. These guys said they would be there and they stuck to there word. A bit late arriving but all things considered I can't argue about that as they are so busy. I now have a happy wife. Big thank to Michael the boss for keeping in touch and of course to eric who arrived with a big smile and was very courteous. Nice job guys. Mike was great! Clean, professional, on time, thorough, and meticulous. On time, clear, and up front. I needed someone out that afternoon. I called several other air conditioner companies and no one would even consider coming out that soon or even the next morning. I called Complete Comfort and got the nicest voice on the other end. She immediately called Michael and he was there within an hour! He did a very thorough check, climbed in my attic and behind my backyard fence to fix all the necessary items that were preventing me from getting cold air. He really went over & above my expectations. He explained to me in detail what was wrong and how to take care of my unit. You won't go wrong with this company! I signed up for yearly maintenance with him because I liked this service so much! 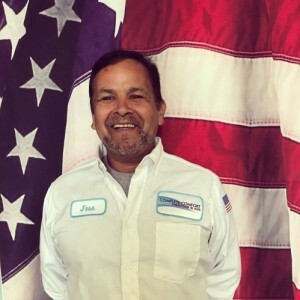 Jose B has a 5-Star rating and leads the company in total reviews, making this pro a ReviewBuzz Rockstar! I am part of Complete Comforts lead Install team. You will find me installing at every install providing you the comfort you deserve. In my spare time i enjoy staying hands on with my profession & playing with my grandchildren. I was blown away by the fast response. We were nervous to call, as we have been burned in the past by repairman and it has cost us a fortune. They were affordable and quick to fix our problem! . Travis, our tech was very knowledgable. I highly recommend complete comfort. We will keep their number close for future use! They actually replaced the heating and AC units. Everyone from the Tech to office staff and installers were friendly and professional. They did an excellent job in what was a very difficult installation. And follow up questions were answered in the same manner. I would highly recommend this company. The service was scheduled promptly and the technician was professional and knowledgeable. They met my high expectations! Worked hard to diagnose the problem & fix. : Tech very knowledgeable and friendly. Your company was recommended to me by a colleague at work. I would like to thank Steve who came out to do an evaluation on our heater. Yesterday. He did a complete diagnostic on our heater and after all of his hard work it ended up being our filter. He is very honest and I can't thank you enough. I would highly recommend this company for any of your heating and air conditioning needs. Thank you. Tech came out same day I called, and they did exactly as they said they would. Courteous and professional. Didn't try to sell me a system a didn't need. Was gracious when I decided to do only a minor repair and leave the complete system replacement until Spring. I highly recommend this company for HVAC service & installation. They have professional /friendly /knowledgeable technicians . The quality of their work is out standing . they are a carrier certified commercial /residential company. If you want it done right the first time call complete comfort & maintenance . Quick, prompt, courteous service with no pressure of up sale. Would recommend them to anyone. The tech was very professional and accommodating. I would use the company again if needed. In laguna niguel, just purchased a home that needed a new system. Mike's crew came out quoted me on a new infinity unit. It's worked soooooo well and I've seen the difference in my energy bill!!! Totally would recommend them! Complete Comfort and Maintenance were fair, professional, and courteous with me from start to finish. They genuinely wanted to find the best solution for me at a fair price, and were willing to wait until I was ready to move forward with the purchase, without calling me every month to pressure me to buy. When I was ready to install the new HVAC system the installers were on time, efficient, and friendly. I would happily recommend them to anyone needing a new air conditioning or heating system.